Ottolenghi is one of the most iconic and dynamic restaurants in the country. Its unique blend of exquisite, fresh food, abundantly presented in a cutting-edge, elegant environment, has imaginatively redefined people's dining expectations. For the first time, Yotam Ottolenghi and Sami Tamimi are publishing here their superb sweet and savoury recipes. Yotam and Sami's inventive yet simple dishes are inspired by their respective childhoods in West and East Jerusalem but rest on numerous other culinary traditions, ranging from North Africa to Lebanon, Italy and California. The 140 original recipes cover everything from accomplished meat and fish main courses, through to many healthy and quick salads and suppers, plus Ottolenghi's famous and delectable cakes and breads. Ottolenghi: The Cookbook captures the zeitgeist for honest, healthy, bold cooking presented with flair, style and substance. This painstakingly designed, lavishly photographed recipe book offers the timeless qualities of a cookery classic. 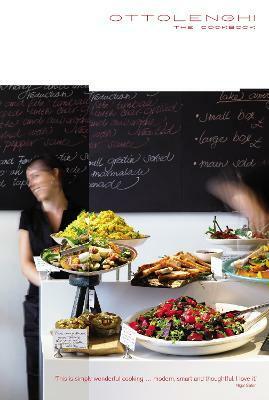 "Yotam Ottolenghi and Sami Tamimi...are purveyors of some of the city's most beautiful food. In this sleek, good-looking volume they spill the beans on some of their best known dishes. It's very modern, very metropolitan... in the vein of the River Cafe and Moro books - and we suspect it will be just as popular with London farmer's market shoppers this summer"